What Makes a Great Love Story Movie? The goal of a wedding reception slideshow is not to bore your guests to the core, but to evoke some tears of joy and hearty chuckles. A quick look back at your and your beloved one’s life stories should be both eye-catching and touching. This way everyone will remember it long after your wedding day and honeymoon. In this guide, we'll share some wedding reception slideshow ideas to help you tell the greatest love story ever existed in a professional manner. 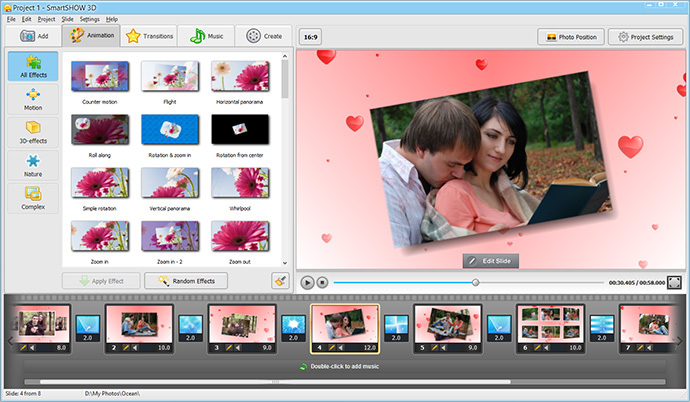 Choosing the slideshow software is one of the first steps. 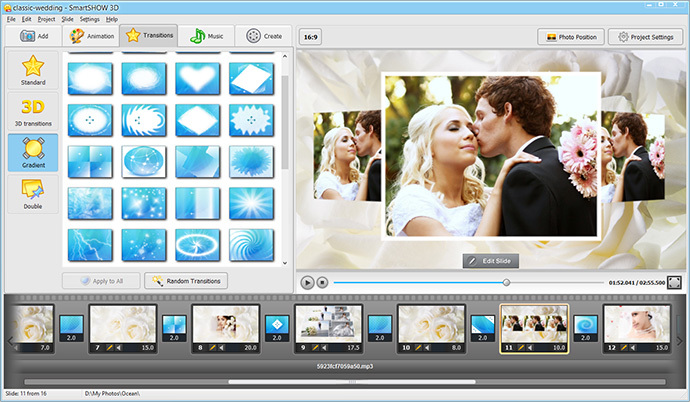 Wedding slideshow software like SmartSHOW 3D will offer you a selection of themed slideshow templates, creative motion and animation effects, slide captions and title clips. When working with this software you will notice its user-friendly, convenient and intuitive interface. Using photos, captions and music, you can easily create a reception video that will leave not a single dry eye in the house. A picture is worth a thousand words, therefore you'd better watch a sample slideshow first! 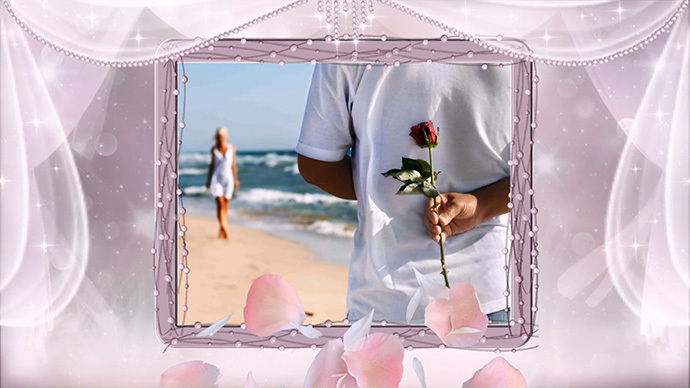 The romantic photo movie presented here was made with SmartSHOW 3D software, and aims to inspire you to share your love story with the world in a most beautiful way. Click Play and enjoy! Now, are you ready to try and create your own love story movie? Read on to learn how to make a wedding slideshow: from the guide below, you’ll discover some essential points and technical tricks, and find links to even more delightful wedding reception slideshow samples. Totally busy with your wedding preparations and cannot afford to spend a couple of hours on working on the slides? Then, take advantage of ready-to-use Love and Wedding templates from the Slideshow in 5 Minutes section. To start with, you can have a look at the wedding photo album slideshow that treasures the precious moments captured during the ceremony and the party. Such pre-designed themes allow you to save time and get a lovely video as a result. The effects and transitions were created and selected for your use by professional designers. To create your wedding reception slideshow with one of these themes, you just need to add the necessary number of love story pictures and engagement photos and choose a suitable song. If you have enough time to work slide by slide, make use of Collages, Animation and Slide Effects. Collages allow you to use several different photos floating graciously across the slide. Adding stylish animation effects to some of the slides will enhance their impact on the guests. Here you can choose among motion, 3D, nature and complex effect types, but if you want to add something more captivating, you can pick a slide effect and adjust the number, speed and direction of twirling flowers, butterflies or hearts. Creative effects will also help you out when the wedding day is over and you need some wedding slideshow ideas. Dealing with transitions, keep in mind that 3D transitions look great with dynamic music whereas gradient effects look best with a slow paced tune. Try to limit yourself to two or three transition types as using too many types in one slideshow will make it look disjointed and distract the viewers' attention from the photos. A classic reception video as well as a classic wedding slideshow usually starts with a handful of photos from "before-I-met-you" times. Then it goes through the love story of the just married, some photos of their family and friends, and the engagement shots. It's a good idea to start each new "chapter" of your wedding reception slideshow with the same transition, so that your guests can easily follow the storyline. Add a tune that matches the fairy tale story of the newly-weds. Select a medium-paced or a fast-paced song. Even if you have a favorite slow song that you want to use, remember that it may send your guests to sleep! Another key point is to keep the flow of photos consistent with the pace of the song you selected, as it is wonderfully achieved in the best wedding slideshow – the music here highlights the charm of the photos and the design. Don’t forget to sync the slides with the music so that the end of your slideshow aligns with the end of the song. In addition, there is a great option to record voice narration and insert it right into the slideshow, so you have an opportunity to tell a fairytale-like plot of your love story! Slideshows for your wedding reception aim for the best way of telling the story of your romance. But here is one more important point to make: however beautiful and moving the slideshow might be, it should not distract your guests from the wedding party that is going on in real time, so try to make it no more than 5 minutes long. Pick the most touching shots from your photo archive to make your reception video a success. So, now that you know how to make a wedding slideshow, go and create a wonderful reception entertainment for your guests!